Just a seventh grader, Chin played both No. 1 singles and No. 1 doubles in wins over Hamden Hall and Kent School to open the season. Chin’s wins in all four matches have helped the Wyverns get off to a 2-0 start. 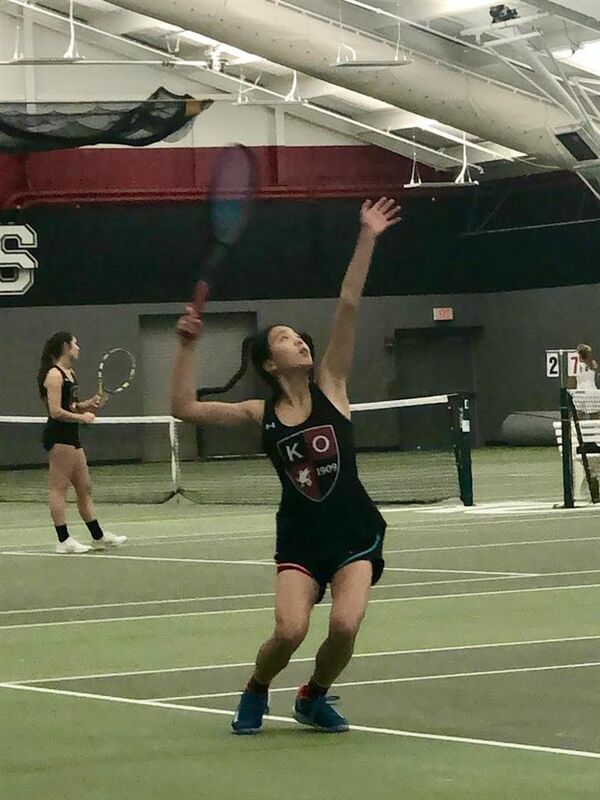 “Kay is a great young tennis player who will do a tremendous job of carrying on the strong tradition of KO tennis,” Kingswood Oxford coach Ron Garcia said. Chin has been playing tennis for six years and says she loves the sport because of the difference between playing in singles and doubles. “With singles it's just you on the court. In doubles, you have someone to help you out and be a team together,” Chin said. Before the season-opening match with Hamden Hall, Chin was feeling a little nervous but a good support system helped her focus on her game and she took care of the rest. As for season goals, Chin just wants the team to keep the same spirit it has now, helping each other and working together. As a team, Chin feels the Wyverns have encouraged each other and we have had each other's backs. Individually, Chin wants to prove herself each time she steps on the court. Favorite athlete: Alex Zverev. He is a young tennis pro who is ranked in the top 5 at 21 years old. He is calm and feisty on the courts and shows his best game and shows a great mental game on the courts. Favorite tennis shot: My forehand down the line because it is a tough shot that I find very easy. For a right-handed player, that would be their backhand, usually a right-handed player’s weakness. Favorite caf meal: is just a grilled cheese or salad.